Following the Girard boys’ previous performance, March 1, the Trojans were able to hold off the Caney Valley Bullpups, 66-55. A career-high 40 points for senior Caleb Muia helped the Trojans (18-3) advance to the championship where they would face familiar opponent Baxter Springs (17-4). In Saturday’s matchup, you could feel the energy and electricity in the gym as it was a win or go home battle. 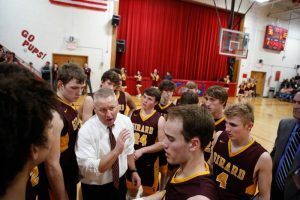 For the regular season, both teams are tied in the series at 1-1 with Girard defeating the Lions in their last game taking the CNC title. The pace became established early with both teams running up and down the floor at a high speed. A great majority of points in the first quarter came inside as the two ground it out in the paint. Baxter senior and top 3A player Trey White would hit a three to trim Girard’s lead to three at the end of the quarter, 15-12. Baxter had no answer for Muia as his putbacks and acrobatic layups gave Girard needed momentum before the half. Multiple players would get into foul trouble early with Coach Rod Wescott digging into his deep bench. Baxter then took advantage of Trojan players resting as they got back into the game midway through, trimming the 6-point lead to just 2. But the Trojans stayed composed going on a run just before halftime. Girard lead the Lions 29-23 at the half. Baxter was not ready to back down quite just yet as they slowly crept their way back in. Multiple lead changes occurred throughout the third quarter with both teams not willing to let their foot off the pedal just yet. Heading into the fourth, the Trojans held a 40-36 lead as the season became on the line. Seniors Doherty and Troike sat out a great portion of the final quarter, giving Baxter an opportunity to take advantage of mismatches. Breaking through the Lions press/trap defense, and scoring off key inside opportunities, the Trojans managed a 4-point lead with one minute remaining. Knocking down clutch free throws, the Trojans (19-3) were able to hang on 55-48 over the Lions (17-5). “I’m just really happy for the kids, they worked their tails off and just nothing but a hard-fought game. You have to give Baxter a bunch of credit they just never would go away, and we did enough there in the end to hand on,” said Coach Rod Wescott. Muia, averaging 30.3 ppg. in sub-state, finished the game with 28 points for the Trojans. Junior Ryder Worrell played a major role in the win as well ending his night with 9 points. Other key efforts include; Troike (8), Collins (3), Henderson (3). Girard is set to play in the state tournament Mar. 6-9, in Hutchinson, KS. Brackets are TBA.